Despite the fact that spring has officially arrived, many parts of the country are still facing snowy and icy conditions, making getting outside seem unbearable. While some are able to spend their time working on their landscapes, others are cleaning up snow on a consistent basis. As our fans have shown us, though, John Deere compact construction equipment helps make any job quick and easy, no matter the weather. Old Man Winter has made his appearance across many parts of the United States, causing below average temperatures and above average snowfall. While everyone can enjoy an afternoon playing in the snow, the hard part comes when its time to remove it. In recent weeks, many of our fans have captured John Deere snow removal equipment in action across the country. We wanted to recognize the great photographers that took the time to capture these images (and videos) and also acknowledge the hardworking people that assist their communities with snow removal. We hope you enjoy as much as we did! John Deere compact track loaders, wheel loaders, and skid steers are all capable of taking on a variety of projects around the job site. Thanks to the expansive line of Worksite Pro™ attachments, owners of these pieces of equipment have the ability to add even more versatility to their equipment. The Worksite Pro lineup recently expanded further as new John Deere snow blade models were added. Each of these new snow utility V-blade models (John Deere BV6, BV8, and BV9) gives operators more flexibility while also improving performance and productivity. But, what else do they have to offer? Let’s take a closer look. Tis the season to grow your productivity! It’s that lovely time of year when snowstorms seem to takeover your entire construction worksite. But, this season, we’re helping you fight back. Don’t let snowstorms control your income this winter. 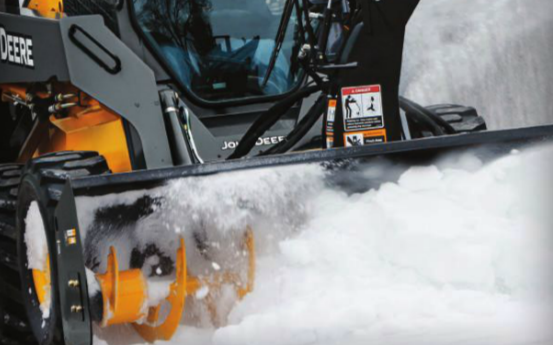 Instead, stand up to the weather and continue piling up the profits with these John Deere snow removal attachments for the worksite. There are numerous attachments that can help you get more productivity from construction machinery all-year-round. 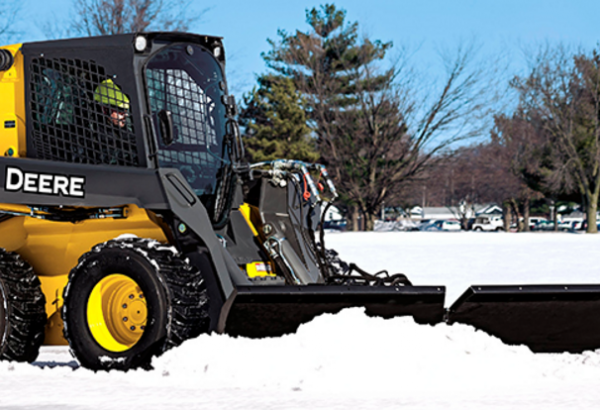 The John Deere Worksite Pro lineup includes several snow removal attachments that can easily hook up to your skid steer, compact track loader, loader, excavator or backhoe, helping you strengthen profits during harsh winter weather. As the longest and coldest winter days approach and the snow begins to fall, it’s time to rev up the engine on your John Deere riding mower. While these pieces of equipment are ideal for the warmer months performing lawn-care duties and tackling yard-work tasks, they can quickly become a residential home owner’s best friend, clearing areas that may quickly be inundated by snowfall. So, as the fall has ended, the grass has been cut and the leaves have been removed from the yard, be sure to keep your John Deere riding mower in a spot where it can be easily accessed, as it’s only an attachment away from being a snow removal workhorse during even the toughest conditions.